Using a top-rated rangefinder for bow hunting sets you up for you clean shots and significantly lowers your chances of missing. We’re all aware that there are way too many options on the market, but here we pick out three of the best ones to help you choose the right tool for your arsenal. After carefully trying out several rangefinders, we narrowed the search down to these three top picks. Odds are high that one of these will fit the bill and add a level of predictablity to your hunt. TecTecTec has a rather unusual origin story. This company was born after a few beers in a bar across the Vannes Harbor, and their first office was in a studio apartment. Just four years after that very fateful night, TecTecTec products are now sold in over 20 countries all over the world. TecTecTec is a trusted brand known for their high-quality cameras and rangefinders and is one of the leading rangefinder vendors online. One of their reliable creations is the ProWild Hunting Rangefinder. 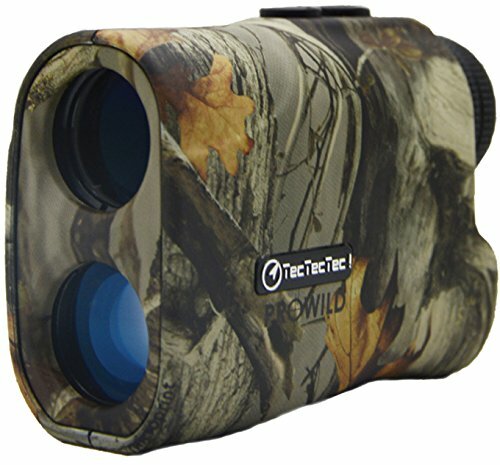 The TecTecTec ProWild Hunting Rangefinder comes in a unique and stylish camo design, along with a case that can be attached to a belt. It weighs just 6.5 ounces and its dimensions are 4 x 2.8 x 1.6 inches. That profile makes it ideal to carry around. 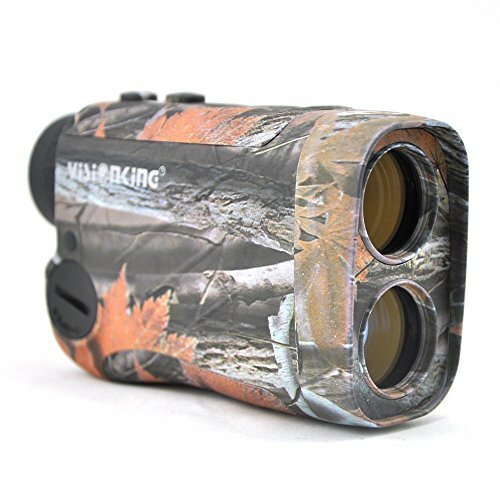 This rangefinder has a six times magnification, and the lens features multi-layered optics that offers a clearer reading. It comes with an adjustable eye relief, perfect for people who use glasses. This rangefinder can be used in all kinds of weather as it is dust- and water-resistant. The rangefinder can easily measure from 10 yards to 540 yards, give or take one yard. The device can measure in yards as well as in meters. For your convenience, this rangefinder was designed with an easy-to-read and clear display. The only downside of this display is that it is not illuminated, so it’s not the best choice for low light or in darkness. This unit operates on a 3V CR2 battery. The unit saves battery by shutting off after 30 seconds of inactivity, an important feature for a rangefinder. As added bonuses, this rangefinder includes a wrist strap, a quick start guide, and a cleaning cloth. Wosports is a company well known for their high-precision hunting and golf cameras as well as their easy-to-use fishing tools. All their products have been given extreme attention to detail so that what you ultimately get in your hands is a high-quality product that will last a long time. Recently, we put one of their proud creations to the test—the Wosports Hunting Rangefinder. Let’s take a look at its features to determine whether it’s really worthy to be among the best rangefinders for bow hunting. 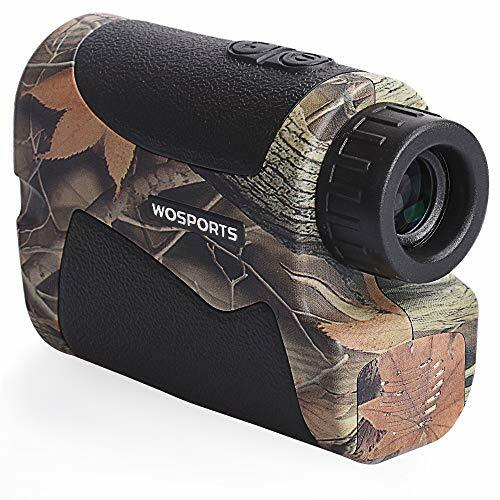 The Wosports Hunting Rangefinder is a fantastic product equipped with numerous features to enhance your sporting and hunting experience. It comes in a case that keeps the rangefinder well protected all the time. There is also a lanyard that provides an added convenience to the user. The rangefinder weighs just 6.3 ounces, and its dimensions are 4.3 x 3 x 1.7 inches. It boasts six times magnification and an objective lens of 25mm. This makes the equipment super compact, and its excellent magnification makes it perfect for golfers as well. It can be easily carried around in your bag as it won’t take much weight. The measurement range on this rangefinder is from five yards to 700 yards, give or take one yard for its accuracy. The downside to this rangefinder is that it isn’t able to compensate for elevation. So, the measurements could be slightly off when you use it off the ground. What we really like about this rangefinder is its display, which is very clear and easy to read. It sports a feature called the fog mode. This feature enables the user to use the screen comfortably even in the thickest fog. This rangefinder isn’t water-resistant but can withstand light rain. However, it is advisable not to use this product during heavy rains. Visionking was established in 1999 by the Shenzhen (China) Visionking Optical Technology Co. Ltd. The company is engaged in the manufacture, design, and the sale of several optical instruments, which include spotting scope, night vision, rifle scope, binoculars, and the likes. All their products feature advanced technology combined with the company’s excellent service and quality. Do you think we’ll find these characteristics in the Visionking Rangefinder? Let’s find out by looking at what it can offer. The Visionking rangefinder is a simple piece of equipment with quite a few impressive features. This rangefinder comes with an LCD display and works on 3V CR2 battery. The unit switches off automatically after some time with no activity. The range of measurement featured on this unit starts from 15 yards to 600 yards, give or take an accuracy of one yard. In addition, it also has a 12mm eye relief. Just like the previous two rangefinders, this one also comes with a six times magnification along with a 25mm objective lens. What truly impressed us about this rangefinder is that it comes with three mode options: golf, hunting, and rain. Upon selecting any one of these three modes, it will make that option a priority, and then function in a manner that works best in that scenario. The dimensions of this product are 4.8 x 2.8 x 1.58 inches and it weighs 8.82 ounces. It features an interesting camo design and comes with a carrying pouch and lanyard for convenient use. A quick start guide and a microfiber cleaning cloth to maintain the rangefinder are also included. Each of these three rangefinders is a fantastic device, and selecting any one of them will definitely benefit you and your hunting game. While the features on all the three are almost alike, we personally prefer the TecTecTec ProWild Hunting Rangefinder over the other two. Why did we choose it over the others? The primary reason is thanks to its solid construction and feel. More than that, it’s designed to survive almost any kind of weather condition. The TecTecTec ProWild is just plain easy to use and delivers reliable results, but you won’t go wrong with any of these models.